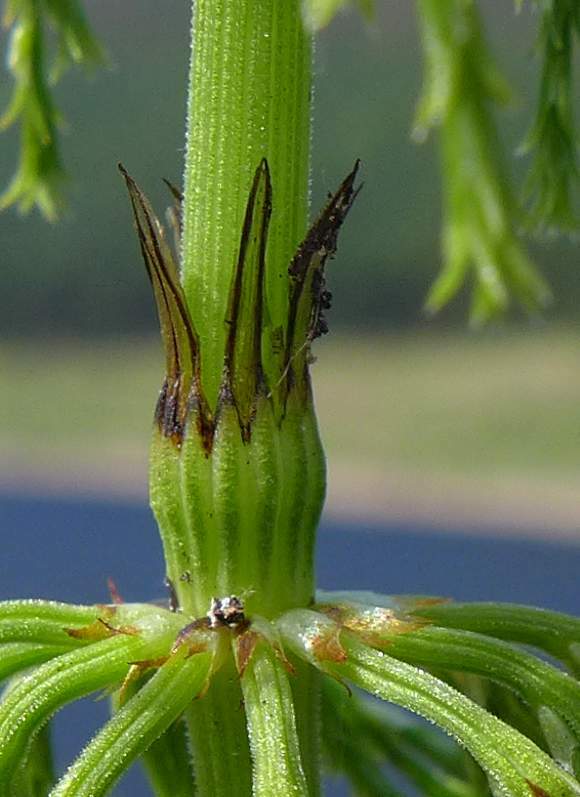 Vegetative stems grow to 50cm (80cm abs. max). 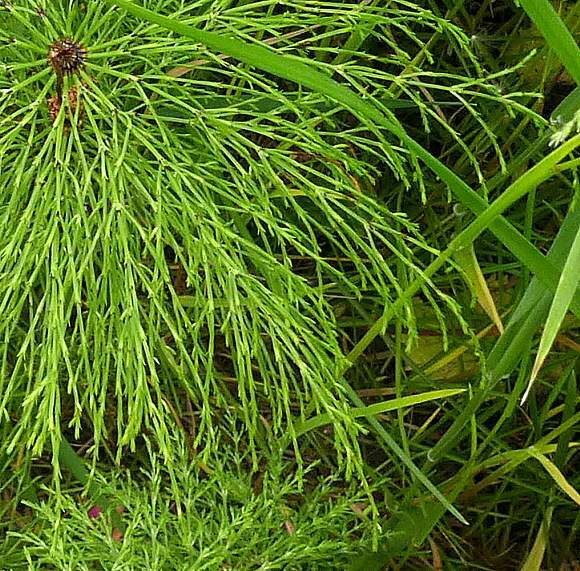 Wood Horsetail is deciduous and slightly rough to the touch. 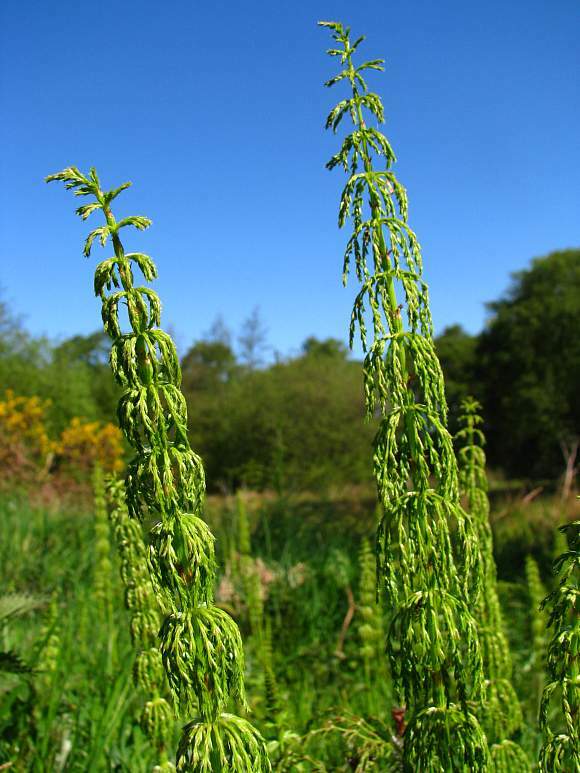 It has whorls of very thin and delicate branches which droop downwards and are themselves branched. The branches are branched, the branches coming off in opposite pairs, up to 6 or so times (best seen top right). This is a shorter specimen, probably not yet fully grown. It may bear a cone at the summit later. 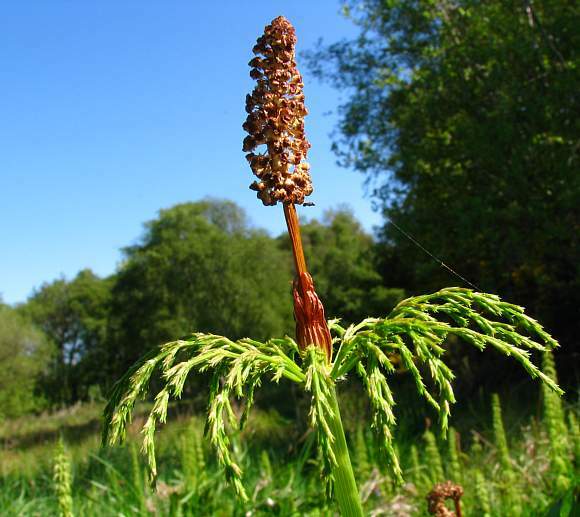 The branches droop downwards on Wood Horsetail.Your Author was on another walk in the very long hot dry 10weeks of Summer 2018 when he suddenly sank a foot in just a tiny patch of mud, coming to a stop on the ground staring a horsetail in the branches. The first Wood Horsetail he has ever knowingly seen. Rather than photograph ir in the mud, he snapped it off and photographed it held in mid-air; it is not really this tall! Just 20cm or so for this specimen. Some tall specimens, in the field too lower down. The leaves are branched, but it is just not easy to see the (very short here) branches. The (very short) branches mostly in opposite pairs are more visible here. 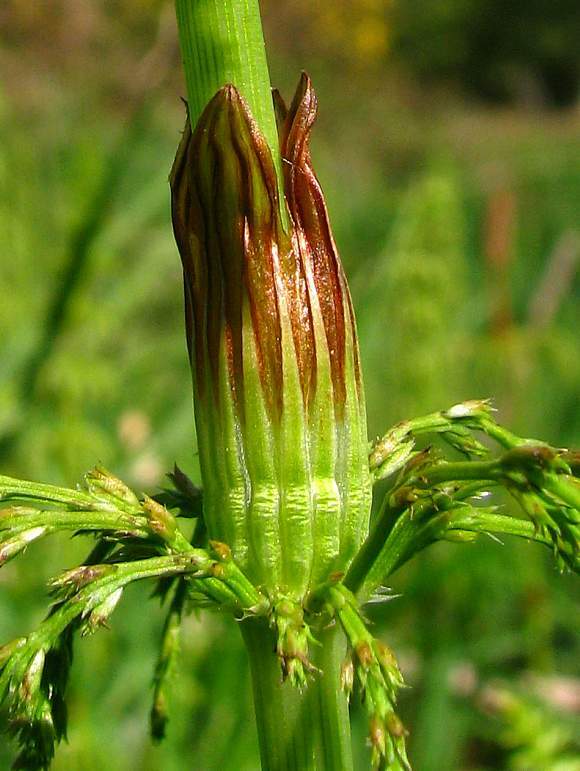 The mature cone (over mature?). The branches are in whorls around the main stem, with each branch bearing pairs of branches up to 6 times. But that is as far as the fractal goes, the branched branches are not branched, branching is limited to just 2 iterations. At each join there are 5 short splayed-out pointed teeth of the leaf-sheaths. . The branches and toothed leaf-sheaths up close. The main stem is ridged with between 10 to 18 nearly flat-topped ridges. The main stem is also in sections, at the junction of which are 10-18 triangular dark-tipped teeth with thin membraneous extensions often merged together at the tops 2 or 3 teeth. 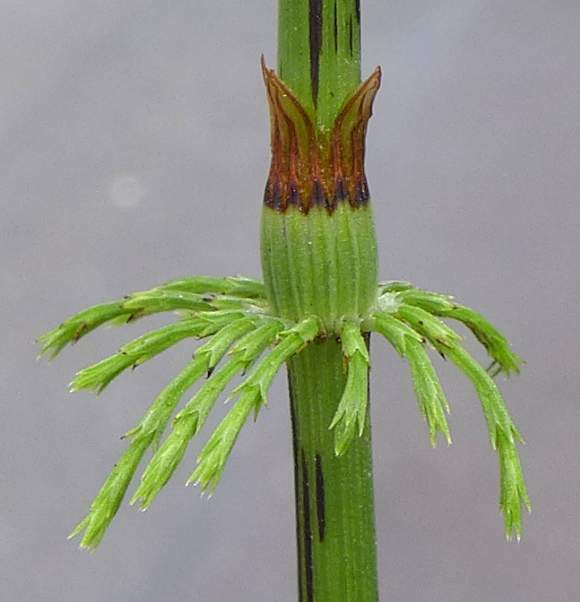 The slight rough feel of the main stem is due to the prescence of many short hairs, probably made of silica, of which, horsetails use quite a lot in their construction. The branches have between 3 to 6 ridges (fewer than the 10-18 of the main stem). 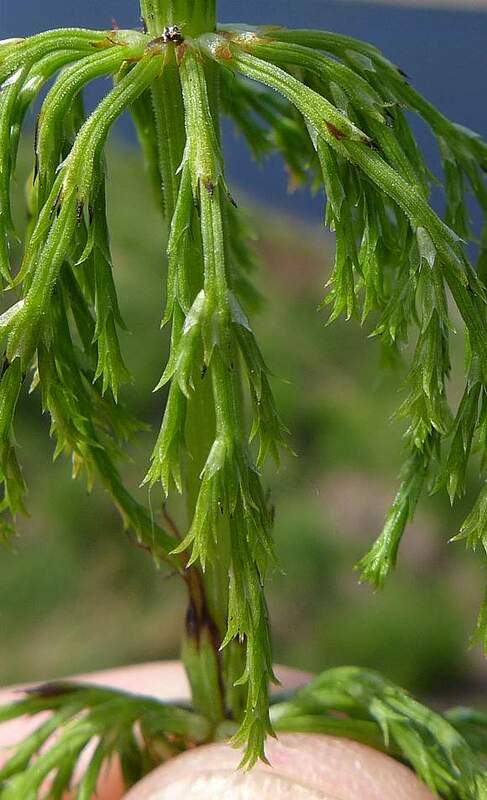 The nodes on the main stem are green; concolorous with the main stem and the branches. The green sheath with its long green sheath teeth are very visible here, as well as the filamentous teeth between those. The filamentous teeth have a translucen edge around a darker centre, and are often fused together into pairs or threes. 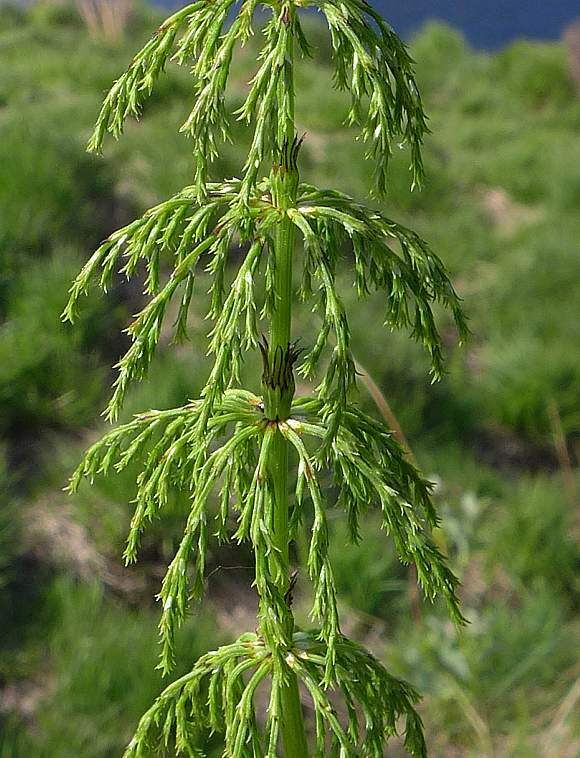 All Horsetails have these structures, but in differing numbers and differing dimensions. 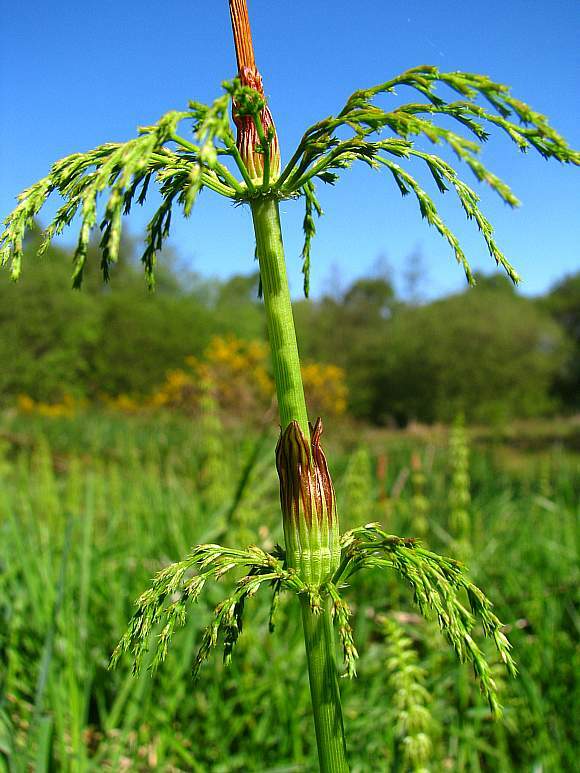 Shady Horsetail (Equisetum pratense) to produce Equisetum × mildeanum which is only found in 2 places in Scotland and the Scottish Islands: Perth and the Outer Hebrides. No coned specimens have ever been found and it is intermediate to the parents in all parameters. 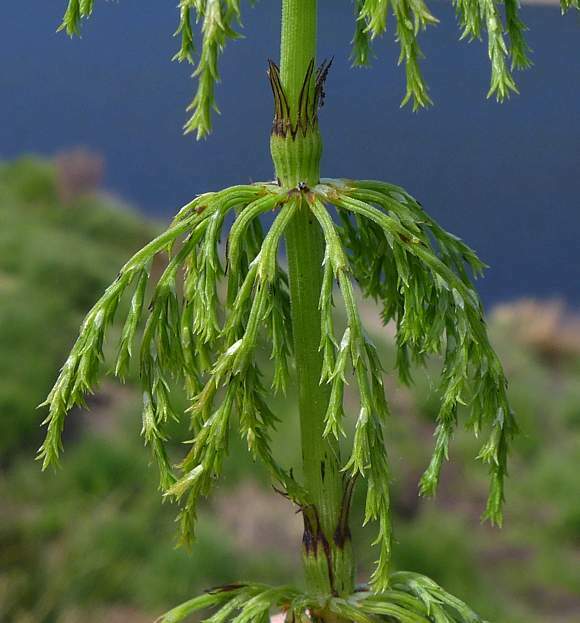 Great Horsetail (Equisetum telmateia) to produce Equisetum × bowmanii which can bear cones but the spores are sterile and when it does it has but few green branches. Found in only South Hants and east Ross in Scotland. 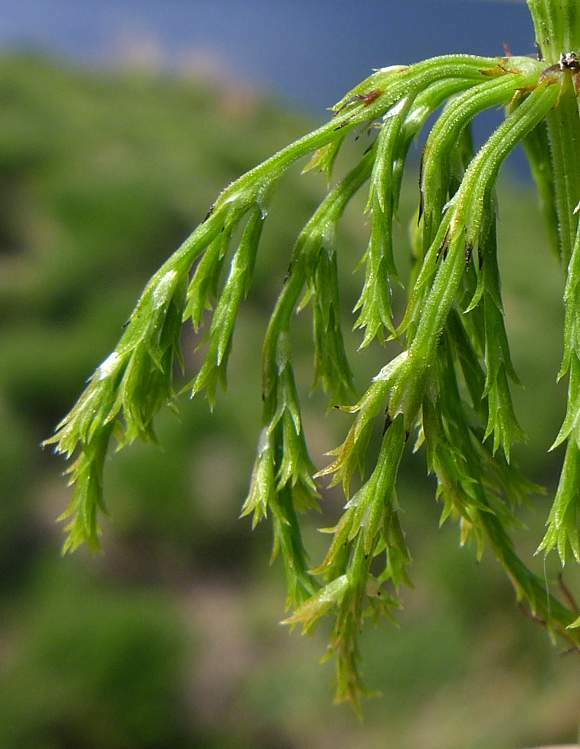 Distinguishing Feature : The only horsetail with drooping branches which are themselves branched-in-pairs up to 6-fold (only few other Horsetails have branched branches and if they do, the secondary branches are irregular and limited to 2 (not up to 6) and don't usually occur in pairs. 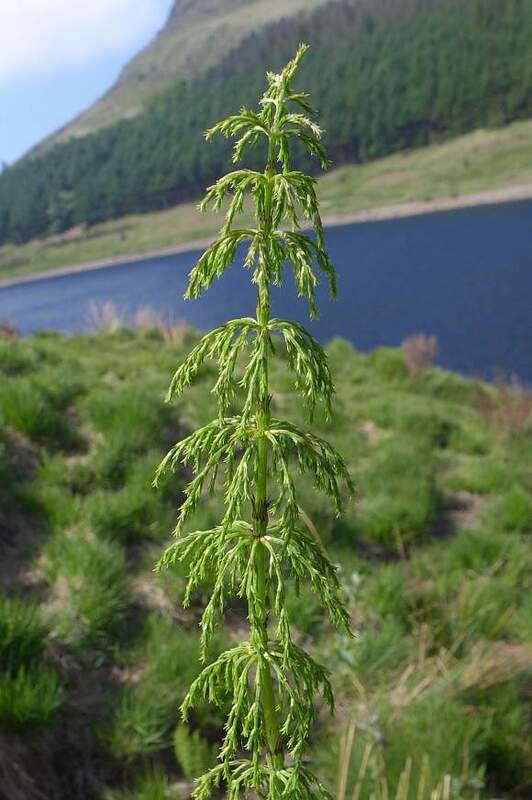 Wood Horsetail is native and not only grows in damp woods but also on upland open moors (where your Author came face to face with one when he sank in the mud), hedgerows, beside streams and banks (but don't expect to get money out of them).